The Opera browser is reborn thanks to the power of messaging. 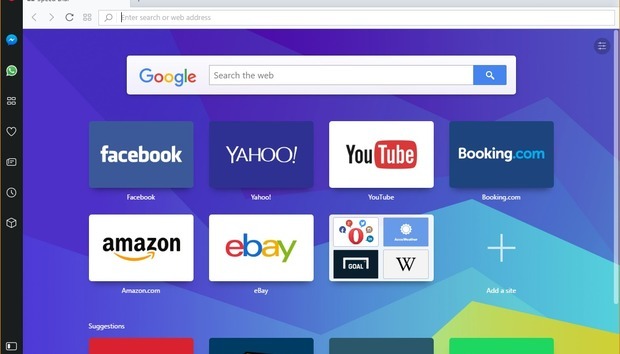 Opera (the company) recently announced that the latest version of its browser is adopting some messaging features from Neon, an experimental version of Opera. The new features include built-in support for Facebook Messenger, Telegram, and WhatsApp in Opera 45. There’s nothing particularly special about Opera’s versions of the messaging programs. WhatsApp is just WhatsApp Web that everyone already uses, while clicking the Facebook Messenger takes you to Messenger.com. What’s different about Opera’s approach is that the messaging web apps don’t open in a new tab. Instead, the messengers appear in a panel that pops out from the browser’s left rail. Opera 45’s new messaging panel. The messaging panel can either overlay the current webpage you’re looking at or be pinned to the browser. When pinned, your messaging apps appear side-by-side with the current webpage you’re viewing. You can only view one pinned messaging app at a time, but pinning one of them pins them all. By default, Opera shows the Messenger and WhatsApp icons when you enable the new messaging feature. Telegram can be added by clicking on the Opera menu icon and going to Settings > Sidebar > Manage sidebar. The story behind the story: There’s nothing particularly new about Opera’s built-in messaging features. Their have been several cautionary tales of social browsers that went pretty much nowhere. including RockMelt and Flock. Both those browsers attempted to integrate full Facebook and Twitter feeds with the browser, whereas Opera is focused on messaging. Still, social sidebars are not exactly revolutionary, and there is yet to be a browser that convinces users that this is the way to go. In addition to the new messaging features, Opera 45 adds new light and dark themes, and on Windows the browser will use the GPU more often for video decoding. Opera says this should mean “significantly higher framerates, higher resolutions, and lower battery usage for these videos.” Perfect for watching all those 60fps videos on YouTube.